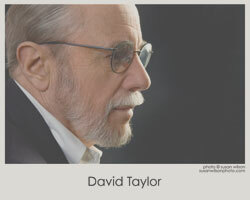 David C. Taylor was born and raised in New York City with a few early detours to Europe. He was incarcerated in schools on both continents until finally set free after completing his formal education at Yale University. He and his brother were free-range children in New York who early on discovered the joys of Times Square, the games arcades, the pool halls, and the jazz clubs. He joined the Peace Corps after college and spent two years in the Marshall Islands. He returned to New York to work as a teacher, and then moved to Madrid, Spain, to teach himself how to write. He returned to New York to work as a bartender in Greenwich Village, and then moved to Vienna, Austria for two years in pursuit of the cellist who became his wife. Realizing that they would starve to death on what they pay short story writers, they moved to Los Angeles where he worked as a movie/TV writer for more than twenty years. He and his wife now divide their time between Boston and an old farmhouse on the coast of Maine. They have two daughters, one who lives in Barcelona, and the other in California. His father, Samuel Taylor was a Broadway playwright: The Happy Time, Sabrina Fair, The Pleasure Of His Company, No Strings (a musical with Richard Rodgers), and a sometime screenwriter: Sabrina, Alfred Hitchcock's Torn Curtain and Vertigo.